Hundreds of mourners turned out to pay their respects to a street-trader who was shot dead outside his Leixlip home earlier this month. Clive Staunton (50) died after being targeted by a gunman as he returned home from the Aviva Stadium where he was selling merchandise earlier that evening. 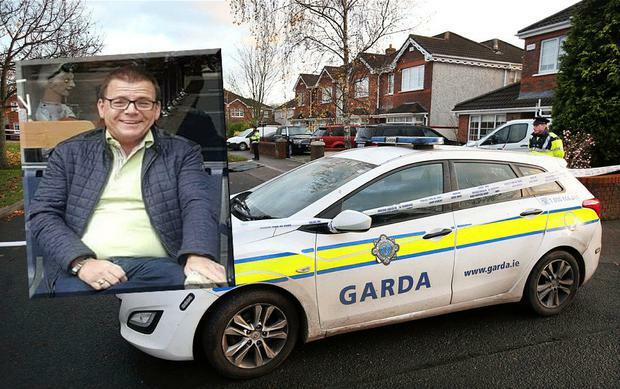 A number of possible motives for the father-of-one’s murder are being probed by gardai, including that he was targeted because he was a distant relative of the Hutch family. This morning his funeral took place at St Michan’s Church in the city centre, close to Greek Street where he grew up before moving to Kildare some 20 years ago. Around 300 family members and loved ones attended the funeral service, several of whom were wearing Manchester United scarves- Mr Staunton’s favourite team. The team’s flag was also placed at the front of the alter close to his coffin "to provide a focal point" in the church. In his homily, parish priest Fr Bryan Shortall said that the community have been left "numbed" by the murder on November 15. “What happened to Clive makes no sense. We are numbed and there are questions and very few answers. “Perhaps the only way to conquer evil is not to drive it out, but to crowd it out and give it no room to breath. “We crowd it out with more and more love, and more and more kindness, and more and more generosity,” Fr Shortall told the congregation. Several gifts were brought to the alter at the beginning of the mass to signify his "loves, passions and interests". They included a mobile phone and a bum bag, representing his work as a street-trader. Ireland and Manchester United soccer jerseys were also brought to the altar. In his eulogy, Clive’s son Ryan thanked mourners for paying their respects and those who helped with the funeral service. He also shared a story of his father from a number of years ago which drew a round of applause from mourners. Following the funeral service Mr Staunton’s remains were brought to Glasnevin Cemetery for burial. He is predeceased by his wife Jacqueline and mother Nellie, and survived by his son Ryan, father Sam and extended family. Detectives are continuing their investigation into the father-of-one’s murder but no arrests have yet been made.